Unfortunately, we’re too early in the evening to know whether or not my GSW prediction is going to come true, but my Louisville bet is already looking solid, so I’m counting it as a victory night for Kyle Cash. But at the same time, the Sixers just lost to fricking Boston AGAIN, and you can officially consider me an Al Horford hater. I cannot stand the Celtics. UPDATE: Louisville managed to simultaneously cover the spread while losing the most winnable game in NCAA history. Solid effort from the Cardinals. Elsewhere in the NBA, the Anthony Davis divorce somehow got uglier with a 30-point home loss to the Magic, Avery Bradley woke up from his coma and nearly sabotaged Memphis’ draft pick slot, and the Los Angeles Losers bottomed out in a loss to Kevin Huerter and Taurean Prince. Might be a May vacation for LeBron this year. A boy can dream. If my prophecy is fulfilled, you’ll be reading this with the knowledge that the Warriors just put an arse-whooping on the Jazz. And that will be good news for us as we break down their last game before the All-Star break against the Portland Trail Blazers. With the Warriors on a nice 5-game win streak (hopefully) and Portland coming off back-to-back road Ls to Luka and Russ, we have a battle of two teams going in opposite directions. The reigning NBA champions come into the game as a 4.5-point favorite with the total set to a juicy 235 points. Cut my life into pieces, Sixers. You bastards. Do you truly, seriously need another recap of what the Golden State Warriors have been up to? I just told you last night. Since then, they have handily dispatched the Utah Jazz (maybe). That’s it. That’s the only update I have for you (it might not be true). Honestly, it’s going to take me a little while to come down from the rollercoaster ride of watching the Sixers lose in dramatic fashion right into a Duke 23-point comeback. So, I’m sorry, loyal Predictem.com readers, but I don’t have much more to say about the Warriors right now. They are destroying everyone and are one of the best teams of all-time, okay? Take that for data. Stylistically, the Warriors should have no problem taking care of the Trail Blazers. Portland does a lot of the things that Golden State does as well but slightly worse. Steph is an upgraded version of Dame, Klay is C.J. plus better shooting and elite defense, and now that Boogie is in the fold, the Blazers can’t even use Nurkic as their trump card. If the Warriors play somewhere between their A and B- games, this one shouldn’t ever be a contest. If, however, Golden State seems a step slow, they still can lean on other facets of their game to come through with a W. They are statistically a fairly average defensive team, but they can shut down anyone on any given night with KD, Klay and Draymond running the show. Additionally, there is no team better equipped to have just one player say, “Eff it. I don’t feel like losing tonight” before promptly burying the Blazers under an avalanche of scoring. Don’t count out the random Steph and/or Klay Heat Check game. In fact, if you see it, don’t you dare change the channel. There’s really nothing wrong with the Portland Trail Blazers. The C.J. McCollum-Damian Lillard backcourt may not ever be good enough to contend for an NBA championship, but they aren’t a team that can be discounted on any given night. We can argue about the ethos of an NBA basketball team all we want, and I would tend to agree with you if you say that nothing matters unless you win a ring. I’m a Michael Jordan guy – of course I am going to agree with you on that. But from a business perspective, there is still merit to putting butts in seats, and Portland has a fun team that their home crowd loves to see. I’m sure they would love to see them even more if they made a conference final, but beggars can’t be choosers. Statistically, Lillard has been able to hang with the Greatest Offensive Player in NBA history, but he owns a putrid 5-14 regular season and 0-6 playoff record versus Wardell Stephen Curry. 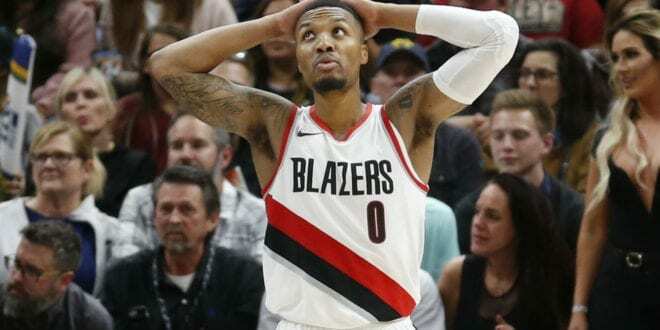 If the Blazers want to take a bite out of the Golden State apple, they’ll need Lillard to be the Lone Ranger. And if his backcourt mate Tito wants to show up too, that would be lovely. The biggest advantage for Portland in this game doesn’t have much to do with match-ups. Let’s face it: they don’t have a single advantage across any of the five positions (honestly, almost nobody does). The Blazers real advantage can only be seen by a wise, trained eye. With several Warriors en route to the All-Star weekend immediately following the game, they are going to have more important things on their mind than a February game against the hapless Trail Blazers. Portland, on the other hand, is a team still trying to make their mark in the league, and annihilating a sleepy Warriors team is a nice boost for them as they gear up for the home stretch of the regular season. Golden State is a far superior team, but I’m going to go full theater coach mode here and ask: what’s their motivation? The Dubs are on pace for another 60-win season and are heavy, heavy favorites to win the title again. They have a collection of talent that would make the 1992 USA Dream Team blush. Portland may suffer from the same pre-vacation blues, but when it comes to apathetic play, the Warriors have no rival. Steph, Klay and KD probably already have their bags packed and their dinner spots picked out. Steve Kerr purposefully let Mike Malone seize the All-Star coach spot just so that he could go home and re-watch Game of Thrones.There’s a non-zero chance that Draymond calls for an Uber with time still left on the clock. There are just too many signs pointing towards a complete and utter mail-in by the Dubs – and for that reason, I am out on them tonight. Do as you so please.